Soft and cozy bedding made from 100% recycled paper, with up to 14 DAYS of odor control for a happier, healthier home. 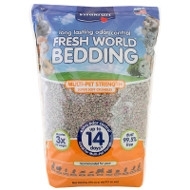 Virtually dust-free and capable of absorbing 3X its weight in moisture, Fresh World® Bedding Multi-Pet Strength is the answer to your multi-pet home's toughest bedding problems. 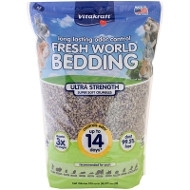 This safe, unbleached, baking soda-free formula keeps your pets' shared homes looking and smelling clean, provides an irresistibly soft burrowing and nesting material, and reduces your impact on the environment.